[SINGAPORE] Four in five Singaporeans are worried funds in their Central Provident Fund (CPF) retirement account will not be enough to meet their retirement needs, a fresh survey by Manulife showed. About 60 per cent of those polled also said there should be more flexibility in fund withdrawal. The grave anxiety over inadequate coverage in the twilight years comes because CPF contributors feel the savings will not be sufficient to cover retirement expenses, and that the returns are insufficient. Those who contribute to CPF can only touch their CPF savings at age 55, and this is after setting aside a minimum sum in their CPF retirement account. The sum is S$155,000 now. When that chance opens up, about 45 per cent say they would take a lump sum after leaving the required minimum balance in the CPF retirement account. On average, pensioners who prefer a lump-sum withdrawal plan would deposit 30 per cent into a bank for funding retirement, use 18 per cent to buy stocks, bonds or mutual funds, set aside 11 per cent for travel and another 10 per cent for property purchases. The rest of the money would be set aside for purposes such as passing on to their children, or buying an annuity. Furthermore, only a quarter of those polled say they make additional voluntary contributions to their CPF accounts. This extra savings come up to an average of 17 per cent of their monthly personal income. The vast majority who do not carve out additional savings say they do not have enough money to make more payments. 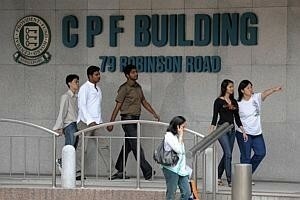 Only 32 per cent of those surveyed would actively manage their CPF. By Manulife's definition, active management refers to a reviewing and, if necessary, a re-balancing of their CPF portfolio at least once every six months. Those surveyed are not attracted to private pensions, with only 22 per cent choosing to buy an additional retirement or pension plan. Naveed Irshad, president and CEO of Manulife Singapore, said in a statement that people should consider developing a diversified portfolio that includes other financial plans to help with meeting their retirement needs.